5G will drive wireless capex higher beginning in 2018, in a cycle that will be stronger than consensus expects. Global capex has been stable, at 15-16% of sales since 2006, with 4G spending in 2012-2014 in pace with a rise in revenue. As a counterpoint, global carrier operating cash flow margins have declined since 2010, from 29.4% to 24.7%, pressuring free cash flow. This derives from increasing competitive intensity as demand shifts sharply to less differentiated data services. 5G brings a prisoners’ dilemma scenario in many markets – aggressive capex would bite into cash flows, but cautious spending could yield sub losses and damage long term competitiveness – that will drive carriers to spend above their plans. 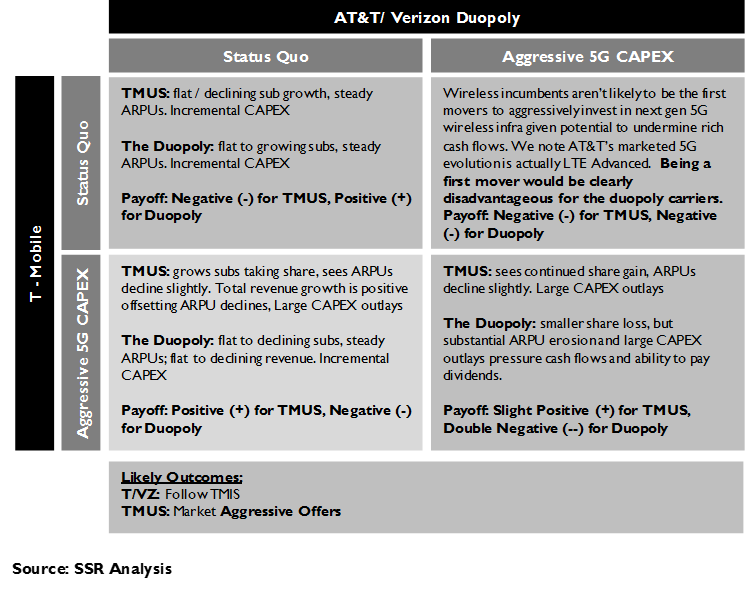 Still, profitability for wireless suppliers (e.g. ERIC and NOK) has historically suffered during periods of network buildout, leading to quarterly misses and disappointing returns. Market consolidation may mitigate overly aggressive bidding this time, but we advise caution. Secondary suppliers, including backhaul, testing, network edge equipment, and towers, will obviously benefit as well. Of these, we are most intrigued with test equipment, where valuations have not yet begun to reflect the 5G opportunity. Optical equipment vendors (CIEN, LITE, FNSR, ACIA, OCLR, etc.) are just beginning to recover from an industry downcycle – 5G related spending should strengthen the upturn. Network edge equipment (e.g. small cells, public WiFi, IoT, etc.) will see strong demand but many competitors – COMM stands out for us. Tower company valuations may already discount much of the upside from 5G, although the near-term consensus for AMT, CCI and SBAC seems achievable. Global wireless markets growing more competitive. In the past 5 years, US wireless voice usage has declined, while data use has increased annually at 71.7%. This has accompanied a -3.7% annual drop in ARPUs, catalyzed by TMUS’s aggressive “Uncarrier” initiative, which took advantage of changing customer needs to grab 9300bp of market share. Similar stories have played out across global markets, with ARPUs falling in every region and eroding dominance for top carriers. This has resulted in stagnant revenues for the industry in the past 5 years despite rising overall sub counts. Carrier operating cash flow is deteriorating. Global average cash margins for operating activities have slid 470 bp since 2010. 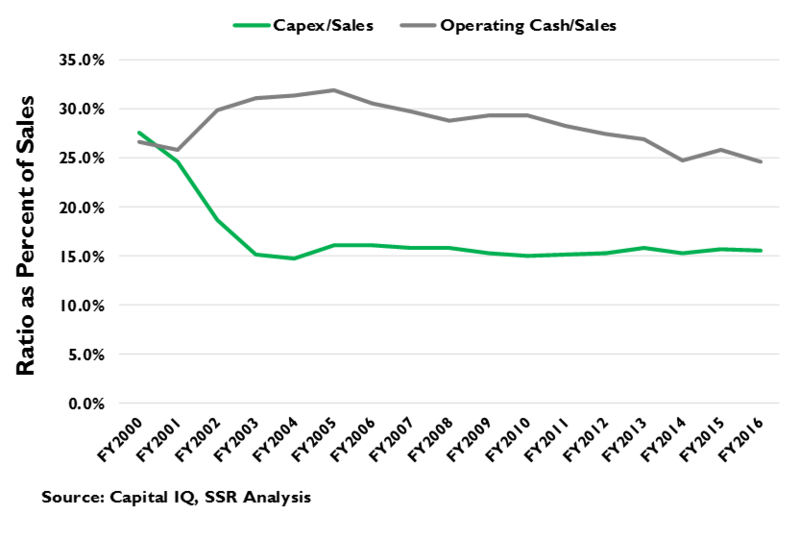 North American carriers have stabilized of late after a sharp drop right at the start of the decade. Still, given declining ARPUs and thus, sales, nominal North American carrier cash flows have fallen in each of the past 3 years, contributing to an acceleration in the global decline in cash generation. 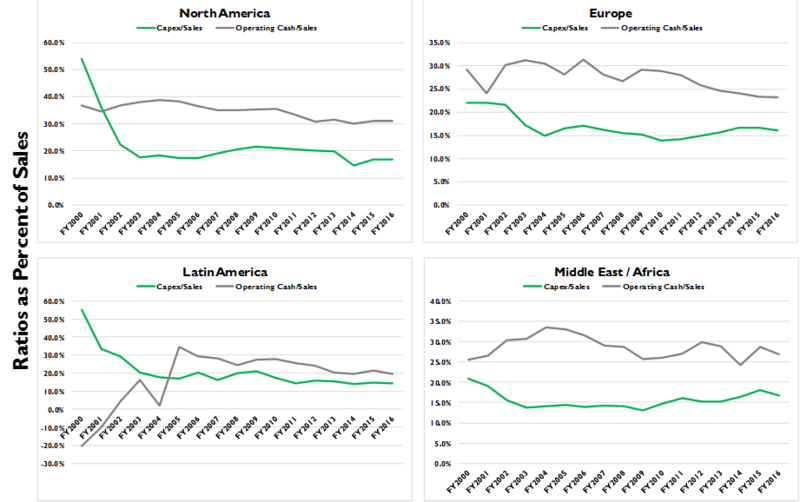 Global CAPEX has been steady. Absolute CAPEX spending has been stable, although falling revenues has yielding a modest increase in the CAPEX/Sales ratio. 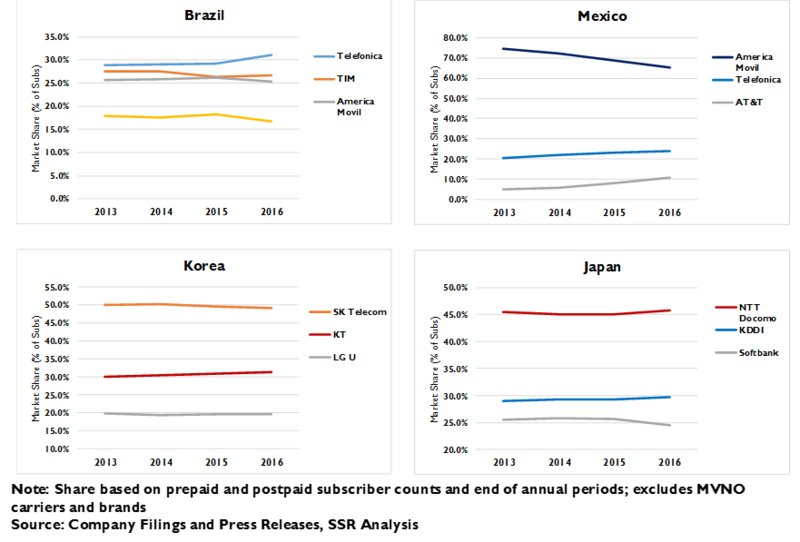 North America has countered the rest of the world, with clearly lower CAPEX/Sales – partly the result of earlier, more vigorous 4G buildouts at the beginning of the period. Still, current North American carrier CAPEX is nearly 200bp below the 14-year post-bubble average. 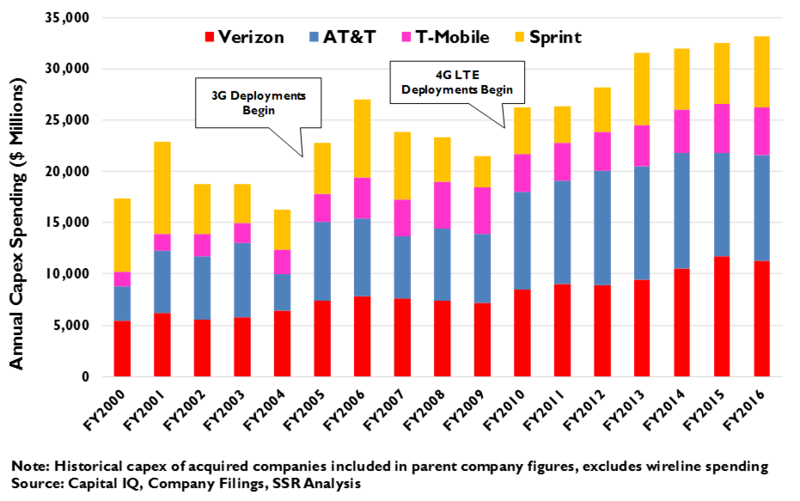 In contrast, Chinese, Korean and Japanese spending has been flattish, while European carriers have raised CAPEX to support their relatively belated 4G deployments. 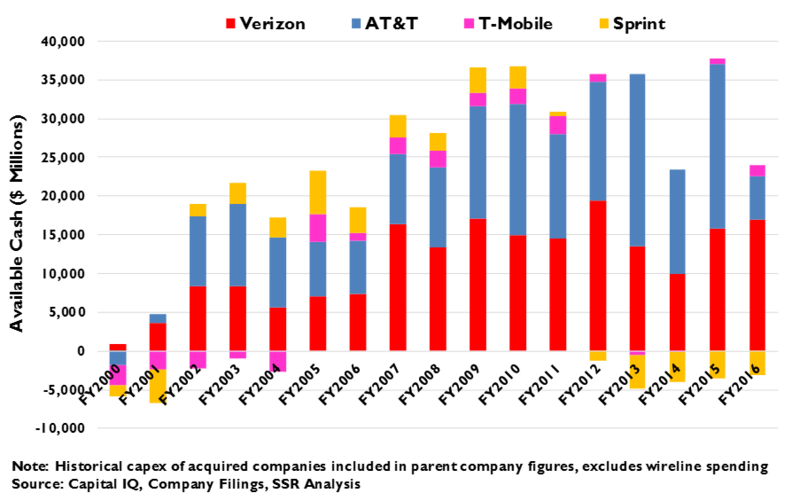 Rising ROW CAPEX/Sales reflects falling revenues more than increasing spend. 5G puts carriers in a prisoner’s dilemma. Leading carriers would like to pull back CAPEX in the face of operating cash flow pressures, but doing so would give challengers advantage for 5G, precipitating further share loss and ARPU pressure. We believe that many of these secondary carriers, without hefty dividend commitments and faced with opportunity to get closer to scale parity, will move aggressively and that market leaders will be forced to step up their own stated CAPEX plans. In this context, we believe that a wireless network spending upcycle will begin in 2018 and will be stronger/longer than consensus models expect. The primary wireless equipment names may still disappoint. ERIC made its post-recession peak in April 2011, amid 4G build-outs, but lost a third of its value in the 5 months thereafter upon consecutive earnings misses. This is not an isolated occurrence for ERIC, which along with NOK, have blamed the rise of Huawei for their poor margin performance on winning network bids. Huawei is now the global market share leader, and the rest of the industry has largely been absorbed by ERIC and NOK, which recently acquired #4 player Alcatel-Lucent. Given the consolidation, it is possible that the survivors will bid more responsibly for 5G contracts, but we remain cautious on the names as long-term plays. Backhaul and testing gear look attractive. 5G CAPEX will also drive demand for complementary equipment, such as backhaul systems (both wireless and optical), edge equipment (5G, WiFi, IoT), and testing gear. COMM, which bridges a few of these categories and supplies macrocell sub-assemblies, is highly levered to 5G and should accelerate both sales and earnings as spending picks up. Backhaul names, like CIEN, LITE, FNSR, ACIA, OCLR and others, at the end of an industry cycle and recently beat up on Chinese spending fears, will benefit from fiber investment for 5G which could drive the next up cycle. 5G, with very complicated spectrum and antenna solutions, will require sophisticated network testing during deployment. Test equipment players (KEYS, TER, NATI, VIAV, Spirent, etc.) remain at modest valuations but have considerable opportunity ahead. Network edge is very competitive. We feel it is too early to make a call on the many network edge companies, although some will likely prosper. The “HetNet” aspect 5G means that WiFi and IoT solutions will be integrated into a broader 5G inclusive architecture. As the nature of small cell deployments gets clearer, it will be easier to identify the winners and losers. We note that architecture of 5G networks raises the importance of mobile datacenters, but note that the involved vendors face pressures from their larger enterprise businesses. There is also opportunity for general telecom components, such as connectors or cabling. Companies like APH and TEL could see a meaningful uptick associated with 5G. As expected, tower companies will do well. 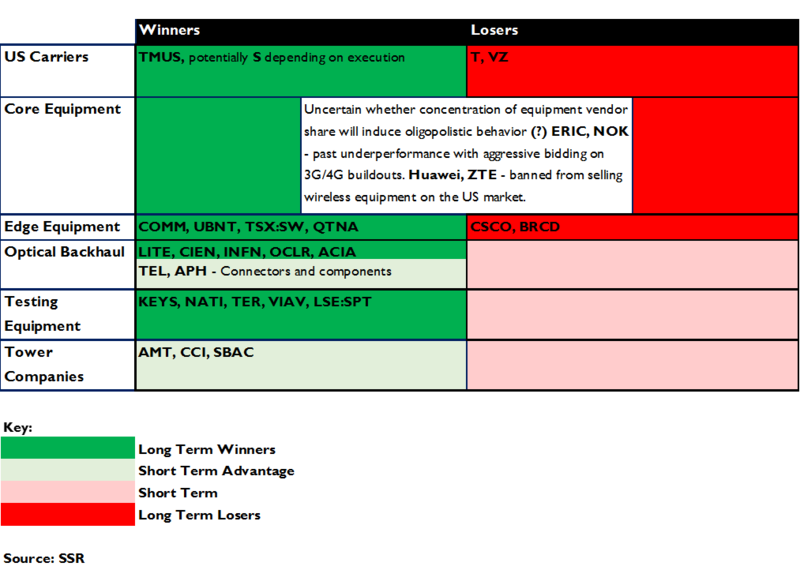 The three US tower players, AMT, CCI and SBAC, have enjoyed an epic run, based on long-term expectations. Obviously, their 60x+ P/Es reflect more than the single digit annual sales growth projected over the next 18 months, arguably baking in a substantial acceleration for future 5G deployments. While we see near term consensus as comfortably achievable, the longer-term expectations may fully value the potential. As 5G technology matures, we see carrier focus likely to shift to small cell and network data center spending rather than the macro cell expansions that drive tower demand. Most projections of global wireless CAPEX spending begin by asking the carriers directly “What do you plan to spend?” On its face, this is sensible, but depends entirely on the companies’ ability to live up to their intentions in the face of market forces. Competition has been heating up amongst mobile carriers around the world – market leaders are bleeding share, while monthly ARPUs fall under pricing pressure. We believe that the sharp shift in importance from voice to data for users has eroded the value of the coverage advantage that top carriers have used to demand premium pricing and sustain customer loyalty. Upstarts can parlay their relatively sparsely used networks to tout better availability in the busiest places at the busiest times, harvesting market share from below with lower prices and more favorable usage policies. Carriers at the top face a prisoner’s dilemma: Raise CAPEX and lower prices, saving subscribers but harming profitability, or hold spending and prices tight, losing share but slowing the impact on cash flow. 5G will make this worse. Carriers that invest aggressively will have service and operating cost advantages to lever against the rivals that hold back. We believe that if one competitor goes for it, the rest will have to follow. Historically, in the US, this has held true, as VZ used jumps on both 3G and 4G service introductions to open a market share and ARPU gap on T that would be much wider save for T’s early iPhone exclusive. We believe this dynamic leaves more cautious outlooks on 5G spending unrealistic. The earliest adopters will begin rolling out pre-standard 5G networks in 2H18, with the market accelerating through 2019 and 2020, when the equipment can be field upgraded to comply with the ratified standard. We believe the global CAPEX to sales ratio will bump up 50-100bp to more than 16%, a level not seen since the 3G buildouts a decade ago. This is because of both the prisoner’s dilemma dynamic, but also the complexity and density of 5G architecture. This is to the substantial advantage of challengers, like TMUS, who do not carry expectations of 5% dividend yields. Strong CAPEX should drive strong sales growth for wireless equipment vendors, but history gives us pause. Previous network building cycles have not generated profits commensurate with revenues, perhaps, because of overly aggressive bidding for large contracts in the face of Huawei’s bid for global leadership. Consolidations leaves just three major players for this generation’s buildouts, so optimists abound, but we advise waiting until deeper into the cycle to be sure of the margins for ERIK and NOK. Beyond the big suppliers, strong 5G CAPEX will be a boon to suppliers of backhaul systems (e.g. CIEN, LITE, FNSR, ACIA, OCLR and others), edge equipment (COMM – first amongst many), and test gear (e.g. KEYS, VIAV, NATI, TER, Spirent, etc.). These companies have not yet seen significant multiple expansion ahead of 5G. 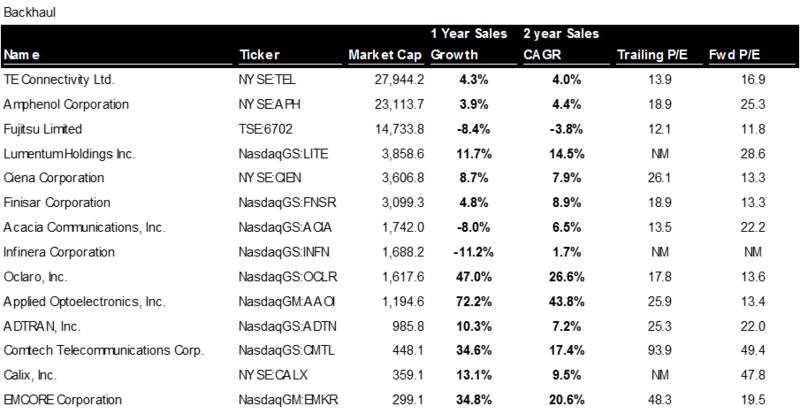 In contrast, tower names (AMT, CCI, SBA) are on an epic run. Consensus forecasts out 18 months are reasonable, but valuations clearly reflect substantial further upside. Our experience suggests that good news (or bad news) is rarely entirely reflected in a stock price, so upside likely remains for towers. 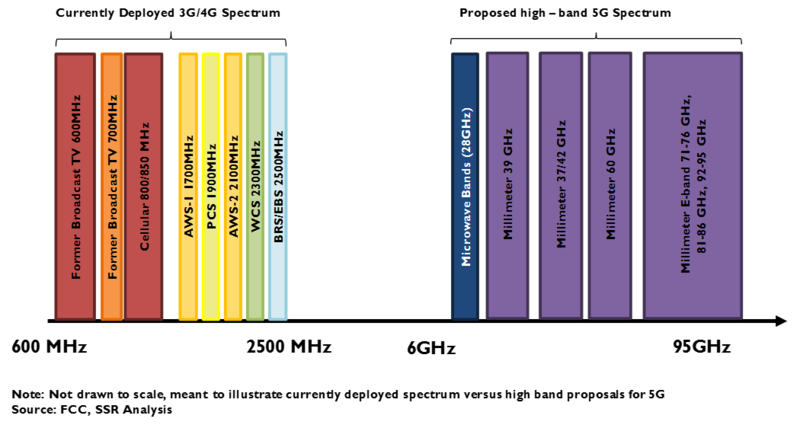 Nevertheless, we prefer the testing and optical backhaul names along with COMM. Like most telecommunications businesses, wireless services have been tightly concentrated by massive fixed investment and the scarce resource of the public airwaves. Leaders have levered first mover advantage, economies of scale and the preferential physics of certain spectrum assignments into competitive bulwarks, often allowing them exceptional profitability on premium pricing. However, there are ample signs that the comfortable status quo is deteriorating. Market by market, the top ranked carriers have been leaking subscriber market share, as lower priced rivals are seeing more success in grabbing customers from under the price umbrella (Exhibit 1-4). In the US, the largest carrier Verizon has lost 80bp of market share over the past two years, while the former fourth place challenger T-Mobile has picked up more than 200bp to pass Sprint for third. 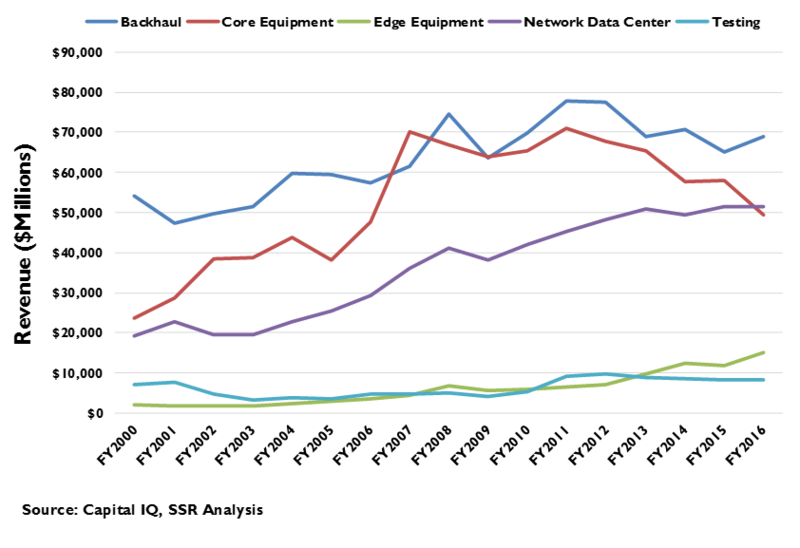 The same market share dynamic is apparent in markets from Western Europe to Latin America (Exhibit 5). The impact is not just on market share. 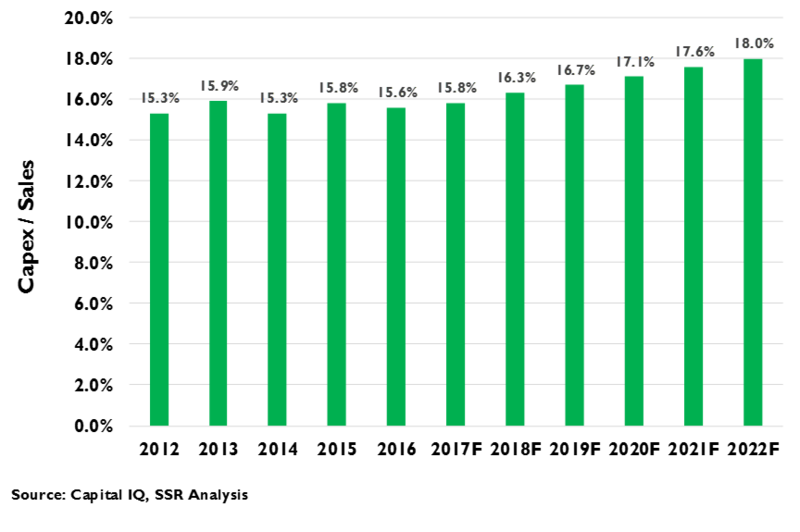 Average revenue per user (ARPU) has also been sliding, even as volumes of data usage skyrocket (Exhibit 6). 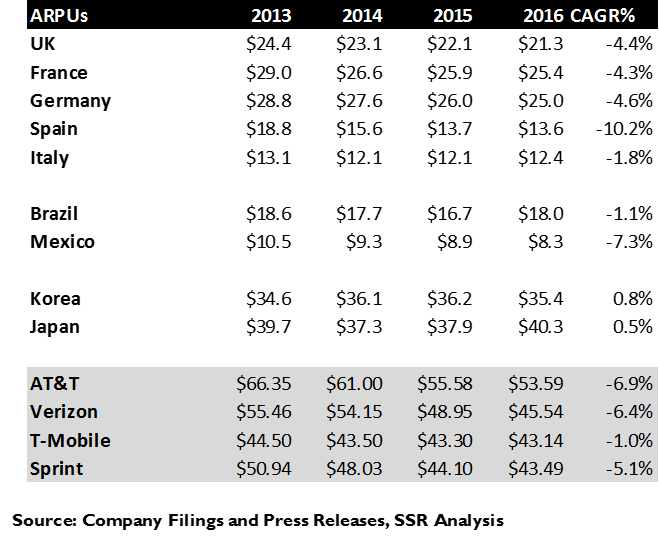 In the US, ARPU has slipped more than 10% over the past 5 years, with Verizon Wireless’s ARPU dropping from $54.15 to $45.54 since 4Q14. The same is true in nearly every international market. In developing countries, much of this may be attributable to a mix shift toward lower income subscribers, but in the largely saturated developed world, competition seems to be the primary culprit. UK ARPU is down 19.6% over five years. French ARPU is down 28.8%. Spanish ARPU is down 27.6%. In the US, the dominance of Verizon and AT&T was preordained. In 1982 the US Government began the process of assigning two licenses in the 850MHz band broken into hundreds of regional markets. In each case, one license was granted to the local telephone monopolist, and another chosen from amongst qualified applicants. Over many years, these licenses were consolidated into nearly national footprints by Verizon and AT&T. 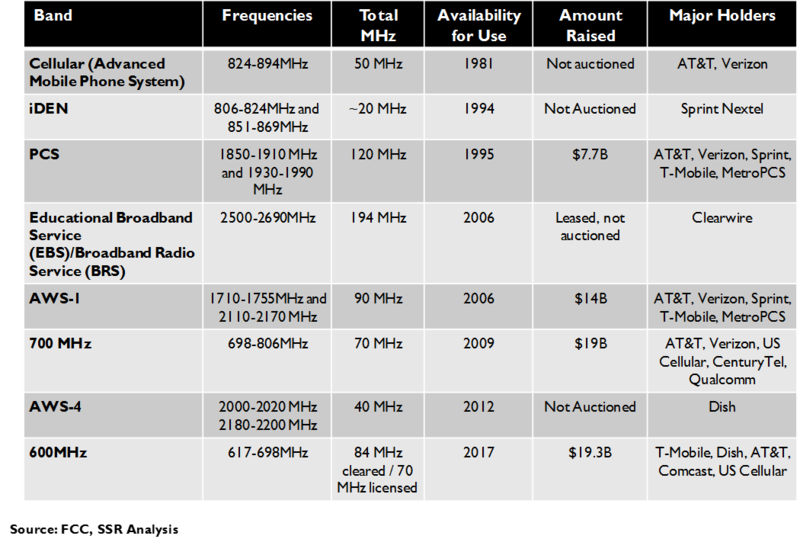 Sprint and T-Mobile’s networks were largely built from the 1900MHz PCS licenses that were auctioned in 1994. By the laws of physics, signals in this spectrum band deteriorated much more quickly than those for the earlier licensees. This made providing unbroken coverage much more expensive. In a market defined by voice service, the higher dropped call rate for the PCS licensees forced them to compete as discount carriers, while the increasingly duopolistic leaders dominated the lucrative business market. The contrast was clear in the “Can you hear me now?” advertising that dominated competition until relatively recently (Exhibit 7). The launch of the iPhone in 2007 catalyzed a change in the way users viewed their mobile devices. With faster and easier mobile internet facilitated by the new App model, data usage began to boom. By 2011, the data boom was matched by a shift to declining voice calling, as younger users seemed to prefer messaging for many communications tasks. We believe that this shift in priority, from voice to data, has changed the way in which consumers evaluate the service quality of their carriers. Unbroken coverage, largely an issue only in infrequently visited settings for most users, takes a far back seat to downlink speeds and data service availability at busy times in busy settings. 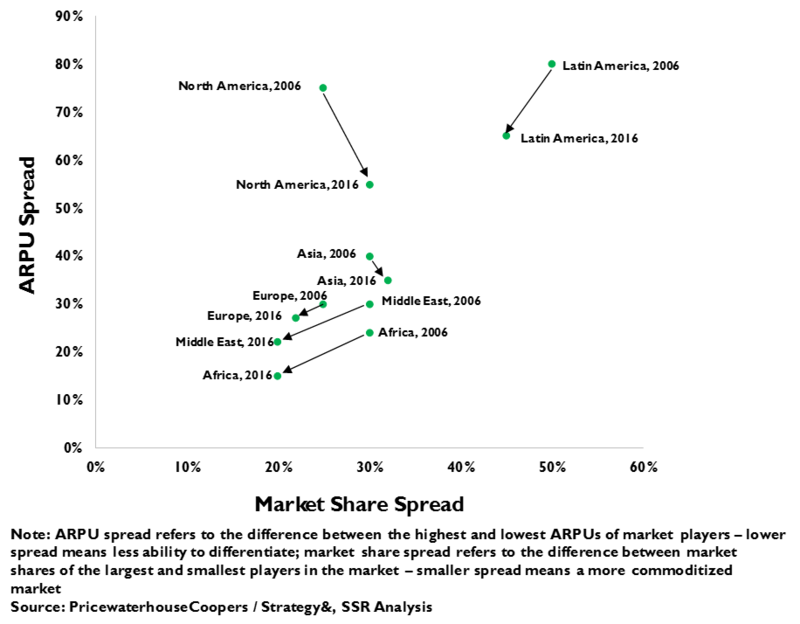 Here, long distance signal propagation and large maximum cell sizes are not very important, and the secondary carriers, with fewer customers and, thus, less congestion have the advantage (Exhibit 8). This is the catalyst for the share shifts and ARPU erosion in markets around the world. Carriers WANT to Conserve Capital Spending, but Can They? As ARPUs have deteriorated, capital spending, as a percentage of revenues, have held very steady – even with the global roll out of 4G over the past 7 years. 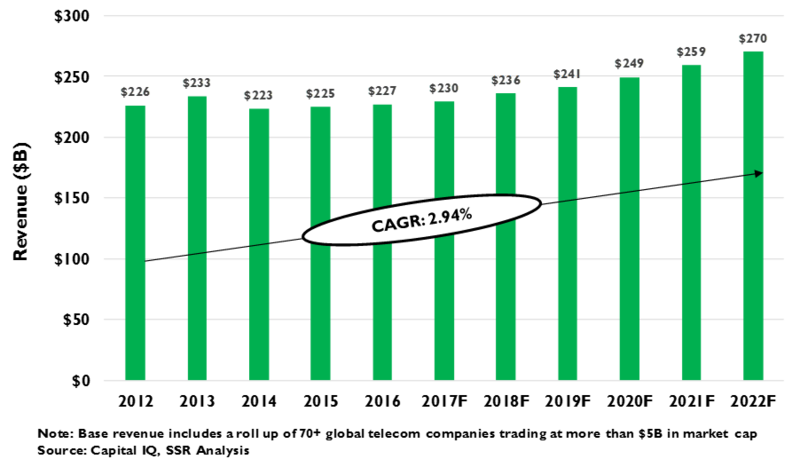 In the past 10 years, global CAPEX/Sales has been in a tight band between 15.1% and 15.9% of wireless revenues. In North America, which did see a significant 4G related bulge between 2008 and 2012, CAPEX/Sales has come down sharply, 340bp over 4 years. The rhetoric from Verizon, AT&T and S is that their capital spending need not rise dramatically for 5G. We are skeptical (Exhibit 9-11). T-Mobile, having spent $8 billion on low band spectrum at the recent FCC auction, is making no such promises. It plans to roll out 5G nationally for service launch in 2020, an aggressive plan that will begin to ramp by 2018. This puts the other carriers in a classic prisoner’s dilemma game. For example, Verizon could choose to move cautiously with 5G (e.g. focus narrowly on offering fixed residential wireless broadband), hoping that T-Mobile and the rest of the carriers either back off their plans or that the technology fails to deliver on its promised capabilities. However, if T-Mobile does what it says that it will do, and 5G works as advertised, it will have a substantial performance and operating cost advantage over Verizon, likely resulting in a sharp acceleration in its market share gains. We believe that Verizon has little choice but to spend on 5G AND to respond to T-Mobile’s price provocation. This will pressure Verizon’s cash margins, but with ample coverage for its dividend, it will be hard to justify not stepping up investment. The same will be true for AT&T, and Sprint will have to follow, putting the industry in a CAPEX boom (Exhibits 12-13). Carriers in China, South Korea and Japan have all signaled intent to move quickly on 5G. 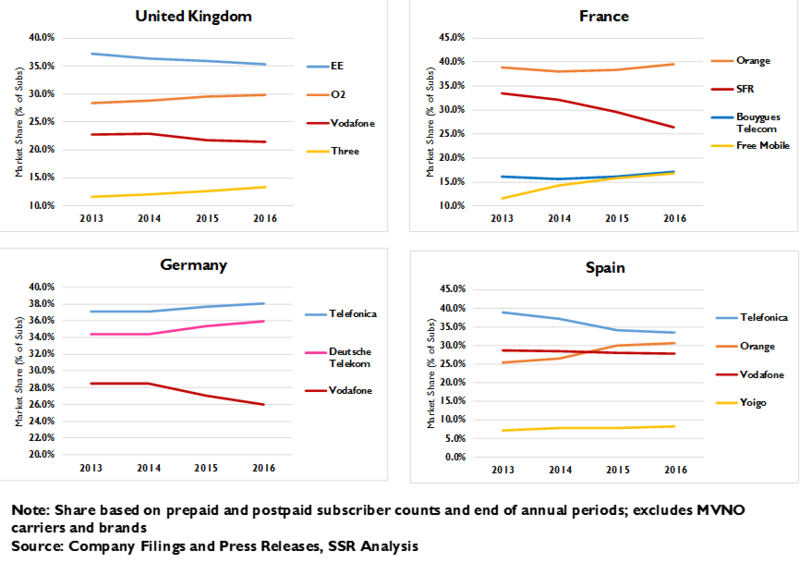 European operators are sounding more cautious notes, but with available spectrum and aggressive secondary carriers, we suspect that competitive pressures will drive 5G spending there as well. This sounds like good news for Huawei, Ericsson and Nokia – between them, they hold more than 90% global market share for wireless equipment. Still, the industry’s track record gives reason for caution. 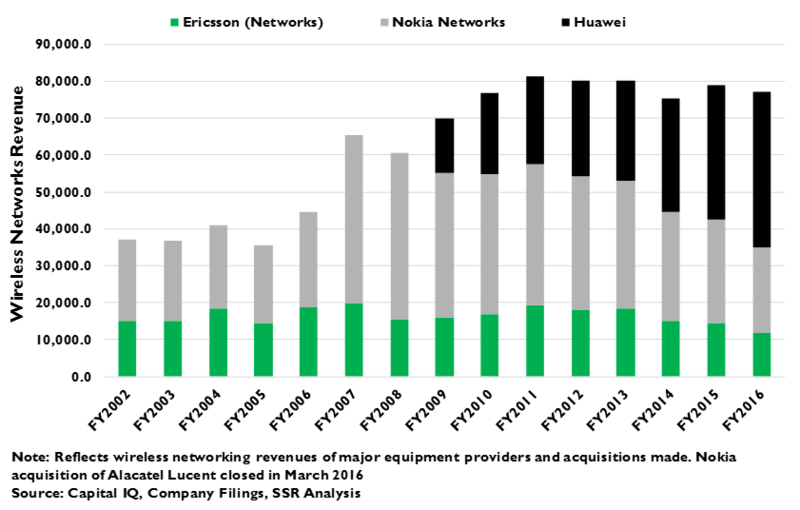 Ericsson – the best indicator as a relatively pure play for wireless infrastructure – saw sales acceleration associated with 3G during the 2004-2007 time-frame and again with 4G from 2010-2014, but despite management optimism, these gains were accompanied by occasional profit warnings and subsequent underperformance. Nokia’s infrastructure results are harder to isolate from its once powerful handset franchise, but anecdotally, the narrative was largely the same. Both companies blamed their weak margins for new network deployments on industry disruptor Huawei – accused of selling below cost in pursuit of share. The industry sees reasons for greater optimism this time around. First, the industry has consolidated – Ericsson absorbed both Motorola and Nortel’s wireless business after the 3G cycle, while Nokia combined its network equipment unit with Siemens’s business, bought out the JV, then, last year, acquired Alcatel-Lucent, to take the list of major competitors down to three. Meanwhile, Huawei is no longer an upstart, leading the industry with roughly 40% market share, and if it had been willing to forego profit for market share before, it won’t be on this round. In this context, it’s possible that the bidding for new contracts will be more disciplined than during previous generations (Exhibit 14). We remain skeptical. Huawei may not have underbid to the extent implied by its western rivals – perhaps it simply has a real and significant cost structure advantage made more imposing by scale. If so, Ericsson and Nokia may still find themselves compelled to bid more aggressively for 5G than they expect. In the US, where Huawei is still banned from selling wireless carrier equipment, relatively benign bidding may give false confidence that profitability will hold as demand shifts to the rest of the world. Caveat Emptor. Even if the primary wireless equipment suppliers pull defeat from the jaws of victory once again, there are other companies poised to benefit from the surge in global wireless CAPEX (Exhibit 16). For example, the traffic and deployment density of 5G macrocells and small cells will require significantly more backhaul bandwidth, much of which will be provided via optical fiber. Optical equipment vendors have struggled to get traction against lumpy demand and vigorous global competition, but the most recent results have been encouraging. 1Q17 saw 4% growth in wave division multiplexing equipment, with growth driven by hyperscale datacenter demand that is unlikely to abate soon. With 5G related opportunities in sight ahead, optical players like Ciena, Infinera, Oclaro, Lumentum, and Acacia should have a sustained period of growth. 5G ought to drive further demand for other general telecom related gear, like connectors, racks, and the like. 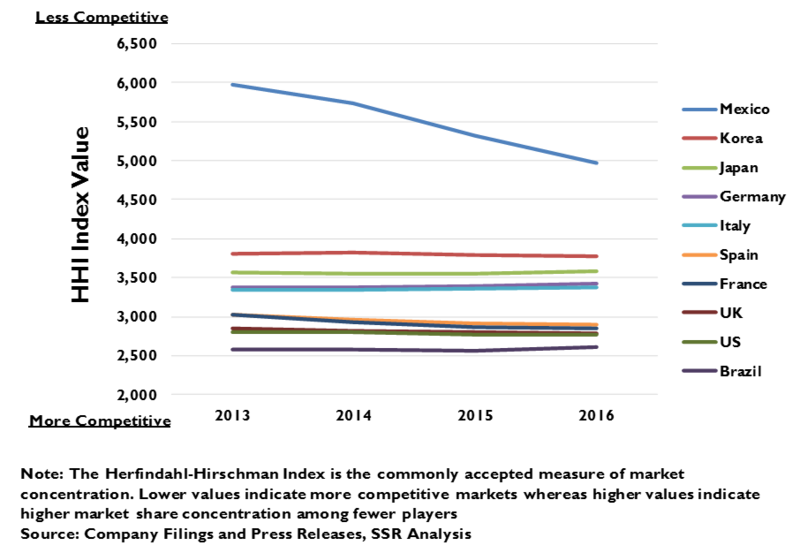 Vendors in this category – Amphenol and TE Connectivity, for example – will also see modest upside (Exhibit 17). 5G “densification” will also see strong demand for low-cost small cells needed to multiply capacity in busy geographies, particularly later in the deployment cycle (Exhibit 18). In addition, 5G is intended to provide for seamless integration of WiFi and “Low Power, Low Throughput” IoT capabililities, bringing an additional set of companies to the party. 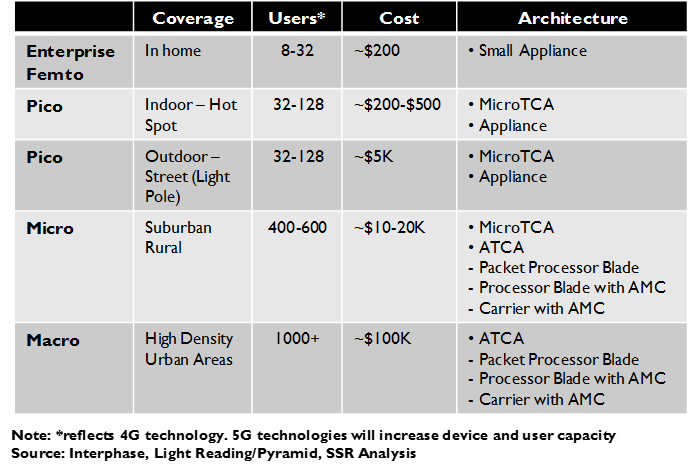 The primary network vendors will certainly lead in small cells, but numerous secondary players will compete for share. CommScope, which provides subsystems for macrocells and other wireless equipment in addition to its small cell products, is well positioned, but it is hard call to choose winners from amongst the many other small cell/WiFi/IoT edge equipment suppliers so far ahead of the carriers’ equipment investment decisions (Exhibit 19). 5G will be dramatically more complex than 4G. 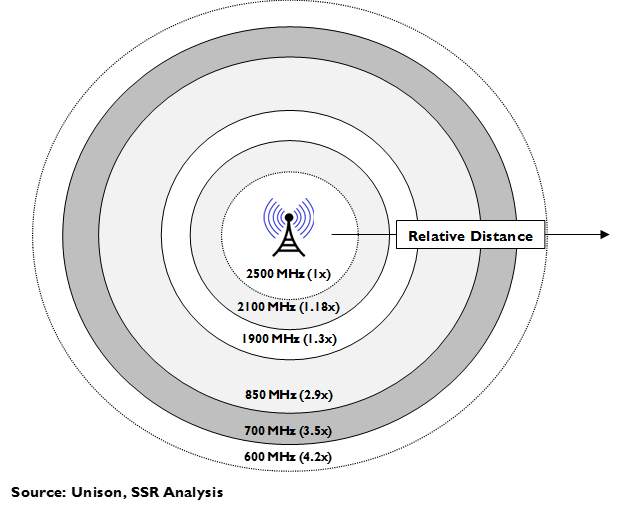 The spectrum bands in use will include those now in use, while extending the usefulness of “unpaired” spectrum and expanding the upper end of useful frequencies all the way to the “millimeter wave” range capped at 95GHz (Exhibit 20). Network densification means many more connected network locations in unusual physical locations, with new approaches for backhauling traffic, such as wireless daisy chains. 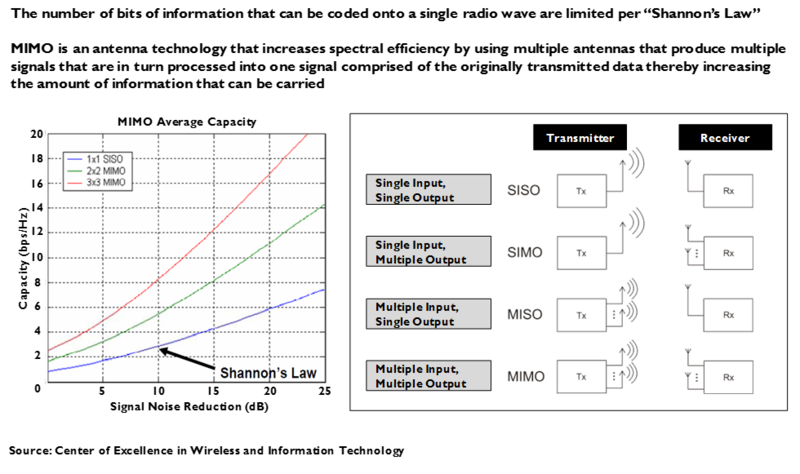 5G will utilize “massive MIMO” with arrays of 128 antennae simultaneously operating on the same frequencies with beamforming to concentrate their signals into precise targeted links with extended range and resistance to attenuation (Exhibit 21). This complexity will require similarly complex and precise testing equipment. With the global 4G rollout having petered out, demand for wireless test gear has been moribund and market valuations are soft. We see significant upside for names like Keysight, National Instrument, Viavi, Teradyne, and Spirent as carriers purchase testing equipment ahead of their 5G rollouts (Exhibit 22). New networks will mean additional demand for space on towers, at least at first, an obvious boon to the companies that own and manage those towers. While sell side consensus projections for American Tower, Crown Castle and SBC for the next 18 months (single digit sales growth with bottom line leverage) seem eminently reasonable, valuations (more than 60 times trailing earnings) suggest that investors see significant further upside down the line (Exhibit 23). We are not inclined to infer that expected news – either good OR bad – is ever completely baked into a share price, but much of the excess returns from 5G may have been already realized. We believe initial 5G spending will begin in 2018, with tower space and testing gear early beneficiaries of the rollouts (Exhibit 24-25). Cell site equipment and backhaul, with phased in deployment and payment partially withheld until completion, will see a slower acceleration in demand. Edge equipment will be the last element of the buildout, with much investment playing out later, as network capacities fill. We see the testing names as the most attractive near-term investments, with the optical players also showing recent strength without benefit from 5G related spending. We have concern for the profitability of the primary wireless suppliers – Ericsson, Nokia and Huawei – and find it difficult to sort out the winners from the many companies with ambitions at the edge of 5G networks. One exception is CommScope, which will play multiple roles for carriers deploying 5G, including small cells. We are enthusiastic for the growth in demand for towers, but see much of that growth already embedded in the sector’s rich valuations.